Stable, liquid and transparent financial markets are a necessary condition for the growth of a modern economy. An economy grows by developing new products and services and incubating new ideas, and this requires capital. Financial markets (also called capital markets) provide a marketplace where savers can find those who need money for new products. These markets work efficiently only if they operate free of government controls and manipulation. Good companies will find the prices of their stock bid up by investors, which in turn brings in new capital, while bad companies are forced out. This mechanism of free-market pricing provides for the efficient allocation of a scarce resource like capital without any need for centralised planning or state intervention. That is at the heart of a modern capitalist system. Critical to the functioning of free and efficient capital markets is the availability of a broad range of financial instruments. In large financial centres such as New York, London, Tokyo, Singapore, etc. there are hundreds of asset classes available for all types of investors. India desperately needs a broad and well-developed capital market if it is to provide the financial resources to support its economic growth and to create employment opportunities for its people. It has developed a large and liquid stock market—the National Stock Exchange (NSE) with a total market capitalisation of about US$2.1 trillion is the world’s seventh largest stock exchange and the second largest in terms of daily share volume traded. But that is about it. India’s bond markets are relatively modest in size as are the commodity and futures markets. It is an astounding fact in a country that has been one of the largest importers of oil, trading in oil futures contracts that allow companies to hedge against oil price increases, started just three weeks ago. In this context, the oversubscription of a recent initial public offering (IPO) of the Real Estate Investment Trust (REIT) is great news. REITs, as an investment vehicle, have been around for almost 50 years in the US, and are now popular in more than 30 countries. In India, they were initially proposed in 2008 but finally formalised by the SEBI in 2014. The first public offering of a REIT was in March this year by Embassy Office Parks, a joint venture between the world’s largest alternative investment fund, the Blackstone Group, and Indian real estate major, the Embassy Group. The IPO, which planned to raise Rs 4,750 crore, was oversubscribed by almost two and a half times. In other words, India’s first REIT generated a lot of investor interest which is an encouraging sign for the real estate sector especially the commercial segment. A REIT is a company that collects money from investors to buy, operate or finance income-producing real estate. The income it collects as rent and the profit from selling property is passed on to the investors. Similar to a mutual fund, which allows investors to own part of a company by buying its stock, a REIT will enable investors the chance to own a share in real estate projects. By channelling capital from savers towards real estate projects, REITs help provide vital capital to help communities grow. Also, REITs remove pressure from the banking system which would otherwise have been required to fund these projects. This, in turn, helps to bring down interest rates. But most importantly, REITs bring professionalism, transparency, depth and liquidity to the real estate marketplace which is essential if Indian real estate is to attract foreign investors. The Embassy Office Parks REIT will be Asia’s largest REIT with a portfolio of 33 million square feet of commercial space across Mumbai, Pune, Bengaluru and Noida. It has 150 tenants of which almost 50 percent are Fortune 500 companies like Microsoft, Google, JP Morgan, IBM, Cisco, Wells Fargo and Mercedes Benz. The company expects to earn annual lease revenue of over Rs 2,000 crore from tenants. Blackstone, with almost 100 million square feet of office space, is the largest owner of commercial real estate in India. This IPO allows Blackstone to monetise some of its investments and sends a strong signal to foreign investors that India’s commercial real estate market is open for business. The development of a transparent and liquid REITs market will encourage many foreign funds to invest in Indian real estate. Additional capital will also come from a large swathe of domestic investors who have so far been shut out of India’s commercial real estate market because of high capital requirements. Now anyone with around Rs 2 lakh to invest can become part owner of commercial properties. The Securities Exchange Board of India (SEBI) which regulates REITs requires that it have a minimum of Rs 500 crore in assets, with at least 80 percent of the capital invested in properties that are already complete and generating rent. A minimum of 75 percent of REIT’s revenue will come from rental and leasing income. Currently, the focus is on commercial properties, but eventually, the REIT structure can be used to raise capital for other real estate projects such as student housing, data centres, healthcare offices, medical facilities and assisted-living communities. REITs are required to raise capital through an open public offering. Investors can buy shares (also called units) in the IPO. Currently, SEBI has put a minimum investment amount of Rs 2 lakh. So, any investor with Rs 2 lakh in savings can get into the action by buying shares in REIT. After the IPO, the shares of REIT must be listed on the stock exchange, and investors can then buy and sell these shares just like any other company. The minimum trading lot size is currently Rs 1 lakh. REITs have significant advantages for investors. They allow small investors to invest in real estate without having to purchase any property. The liquidity provided by the listing of REITs on major stock exchanges will make real estate investing fast, easy and efficient, allowing investors to get in and out of their investments quickly. Continuous pricing of REIT shares in an open and free marketplace will bring much-needed transparency and price discipline to the sector. What returns can investors expect from REITs? 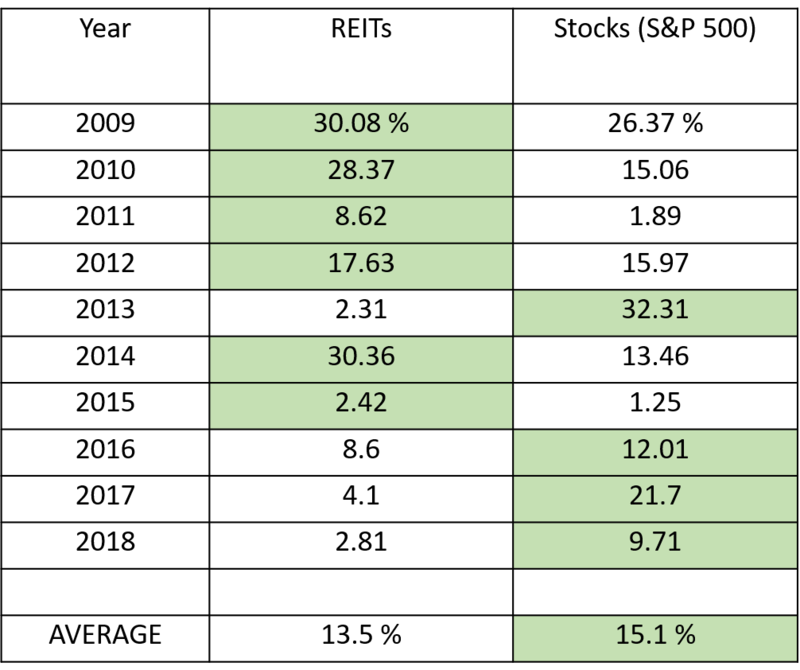 The table below, based on data from the US, shows the annual investment returns (in percent) from REITs and stocks for ten years from 2009 to 2018. Although stocks had a higher average return over the ten years, REITs outperformed stocks for six out of ten years. The real benefit from investing in REITs is the diversification it provides. The concept of portfolio-based investing is still new in India. Most investors don’t appreciate the benefits of diversification as a strategy to reduce risk. There are two types of risk that investors face—unsystematic and systematic. When investors put money in a mutual fund, they reduce unsystematic or company-specific risk because mutual funds invest in a broad portfolio of stocks. But buying a bunch of mutual funds will not reduce systematic risk which is the risk of the entire stock market going down. That risk can only be mitigated by investing in a broad range of asset classes like bonds, gold, real estate, commodities etc., which are unrelated to stocks. The critical variable in portfolio management is the correlation between different asset classes. To achieve proper diversification and to reduce systematic risk, investors need to consider asset classes that are unrelated so that when one asset class is doing poorly, the other compensates by going up. Bonds are a popular way to diversify due to their very low correlation with other major asset classes, particularly stocks. Another viable option is real estate, which has a relatively low correlation with the stock market. Until now, the latter was unavailable to most small investors in India, but with the introduction of REITs, investors can add real estate diversification to their portfolio. Historical data shows that stocks and REITs have a very low correlation (globally it is around 0.2), which suggests that REITs provide a nice diversification benefit and must be included in every investor’s portfolio. An allocation to REITs can help reduce the overall risk of an investor’s portfolio while at the same time providing increased returns. This is particularly true during periods of high inflation when stocks suffer and real estate does well. The portfolios of large institutional investors like global pension funds generally include real-estate assets with target allocations ranging from 4 percent to 10 percent. Globally, REITs make up about 5 percent of the entire universe of investible assets, which is a good benchmark for how much a typical investor should allocate to REITs. The success of India’s first REIT offering is a very encouraging sign for those who believe India has the potential to become a significant global financial centre like Singapore and Hong Kong. India is a capital-starved country with huge capital requirements for new infrastructure. There isn’t enough tax money to pay for this, so the money will have to come from capital markets. The development of India’s capital markets must, therefore, be given the highest priority. In 2009, a committee headed by ex-RBI governor Mr Raghuram Rajan put together a report titled A Hundred Small which provided a comprehensive blueprint for financial reform in India. The next government should make it a policy priority to implement these reforms. Infusion of capital through innovative financial instruments is the only way to produce double-digit growth in India.